Vacation Concierge Proudly Represents… BEACH RETREAT! BEACH RETREAT is just minutes away from the beach, the Dana Point Harbor, shops and restaurants in the sleepy little beach side community of Dana Point. This beautifully furnished 2 bedroom / 2 full bathroom condo is perfectly situated in the upscale Monarch Hills Condominium complex in the gate guarded community of Ritz Point. 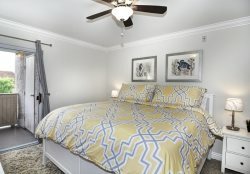 BEACH RETREAT sleeps 4 comfortably in beds and is spacious enough to host two couples or a single family. It’s a VERY AFFORDABLE retreat and vacation hideaway from the hustle and bustle of everyday life. It’s also perfect for a short term work assignment with plenty of room to bring the entire family! While there are not stairs to get to the unit, there are residents below. Please be conscious of this as you move from room to room on the tile floor. This rental also offers a designated covered single carport with plenty of uncovered parking for a second car on a first come / first parked basis. There is a full size washer and dryer located in a utility closet off the patio and there are beach chairs, umbrellas, and boogie boards provided for your use. BEDROOMS & BATHROOMS: Once inside the entire condo is at one level. The Master Bedroom features an en suite bathroom and king size bed. There is a huge walk in and plenty of storage. The second bedroom features a Queen size bed and a walk in closet. The second bathroom is a full bathroom and doubles as the public powder room. KITCHEN & DINING: This fully outfitted kitchen is bright and airy and offers everything you’ll need during your stay. Cooking is easy with all new stainless steel appliances and the quaint breakfast nook is the perfect location to begin your morning. The separate dining room seats 4 is directly adjacent to the kitchen. FAMILY ROOM: This spacious floor plan features a comfortable couch, overstuffed side chairs, ottomans, a fireplace and a large Flat Screen TV. Wi Fi is of course included! OUTDOORS & COMMON AREAS & AMENITIES: Open all the windows and feel the cool ocean breezes! The wrap around patio offers access to the Family Room, Kitchen, and Master Bedroom thus expanding your livable area by bringing the outdoors inside. There are greenbelts and professionally landscaped grounds throughout! There is a resort style pool and family spa and two adult spas throughout the community. One of the adult only spas features gorgeous views of the ocean! The pool area also offers a small gym and clubhouse available to all our guests. There are also two wonderful trolleys available to take you out and around Dana Point and another trolley to explore Laguna Beach that picks up and drops off at the neighboring Ritz Carlton. MANAGEMENT: Very clean and professionally managed. Vacation Concierge is quick to respond. They’re available 24/7 for any questions, issues or concerns that come up during your stay. SUITABILITY: Non-Smoking home. Must have an adult(s) staying at the house during the term of the lease. LOCATION: Dana Point is a city located in southern Orange County, California. It has one of the few harbors along the Orange County coast, and with ready access via State Route 1 (the famous Pacific Coast Highway or PCH). Dana Point and surrounding communities of Laguna Beach and San Clemente are popular local destinations for surfing. ATTRACTIONS: SEASIDE STRANDS is just up the road from the O.C. Dana Point Harbor and downtown Dana Point. Located towards the northern section of Dana Point, it is just a short 15 minute drive into the beautiful and 'artsy' seaside town of Laguna Beach. It’s also convenient and within a short 15 minute drive (or a 30 minute bike ride for the more adventurous types) from the historic San Juan Capistrano where the Mission San Juan Capistrano and the quaint Los Rios District is surrounded with charming antique shops, restaurants, and art galleries. There’s even a petting zoo for the smaller members in your family! Come and explore Dana Point at BEACH RETREAT! We look forward to having you as our Guests!